b. michael known in the industry as "New York's best kept secret," is no longer a secret b. michael's career in fashion spans over a decade. 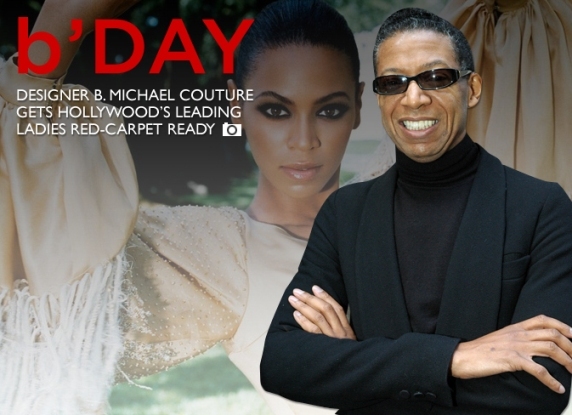 You may have seen his scene-stealing designs in "Madea's Family Reunion" and "Ugly Betty." This exquisite designer has presented collections worldwide in such cities as New York, Beijing and Shanghai. When gala goers like Cicely Tyson, Tamara Tunie, Susan-Fales Hill and Lynn Whitfield need a dress that makes them look and feel confident, they turn to b. michael for a flawless design. District first lady, Michelle Fenty and inaugural poet Elizabeth Alexander have selected b. Michael to create their gowns for the inaugural ball. It has been said of Elizabeth Alexander that her 'poems bristle with the irresistible quality of a world seen fresh, and her instinct for turning her profound cultural vision into one that illuminates universal experience'. This is b michael's inspiration for the tone." For the few who don't know b. michael is no stranger to the fashion world this exquisite designer once designed for Louis Feraud and Oscar del a Renta before he launched his own line in 1999.